This past September, I explored the tropical paradise of Sumatra. I’ve always wanted to visit this breathtaking Indonesian island, which is home to the critically endangered Sumatran orangutan. Sumatra offers picturesque views and exciting adventures for nature lovers, but it’s the islands diverse wildlife that really stands out. While there, I embarked on a once-in-a-lifetime orangutan trek in Gunung Leuser National Park. This remarkable experience was one I’ll never forget. Keep reading to learn more about trekking with orangutans in Sumatra! There are less than 15,000 Sumatran orangutans left in the wild, classifying the species as critically endangered. 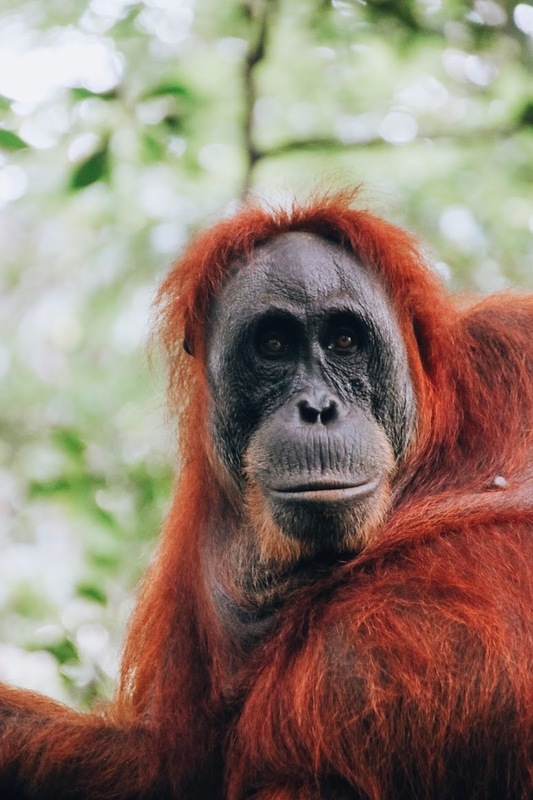 Deforestation and illegal trading have brought these fascinating creatures close to extinction, but the island is working hard to protect the remaining orangutans through conservation programs. Joining a guided trek is a wonderful way to get up close and personal with orangutans while remaining respectful of their environment. This activity is a top attraction in Sumatra, and the town of Bukit Lawang is the place to be! Bukit Lawang is where I began my orangutan trek. This small village sits on the edge of the Bohorok River in Gunung Leuser National Park and is home to an iconic orangutan sanctuary. The locals are used to tourists and are extremely friendly. While you’re visiting, spend some time with them to learn about the daily life. You can also buy handicrafts made by local artisans and visit the most unique restaurant in the world! As you set off on your trek, you’ll head deep into the jungle. With Acanela’s tour, travelers are able to spend two days twisting through towering trees and lush vines. The best part about hiking in Gunung Leuser National Park is the opportunity to see a wide variety of wildlife. In addition to orangutans, there’s vibrant butterflies, slithering reptiles, various birds, and other primates, such as the Thomas leaf monkey and white-handed gibbon. It’s even possible to stumble upon a tiger or elephant—although it’s very rare. 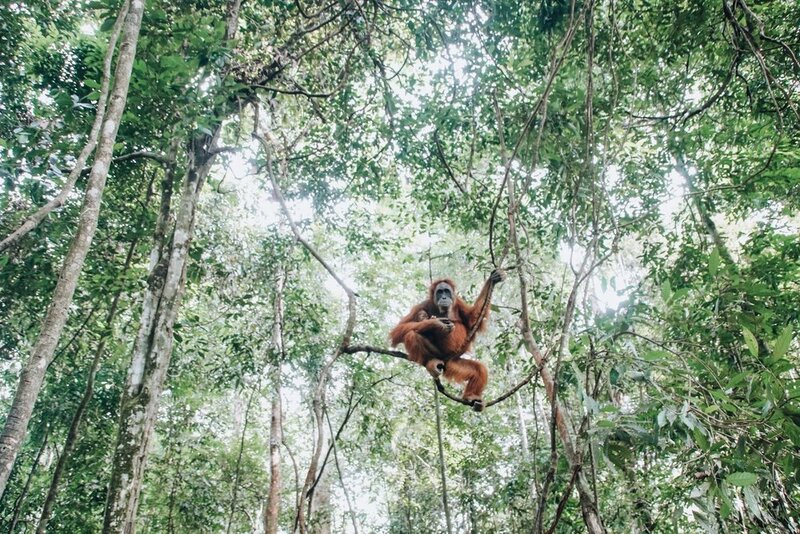 Seeing Sumatran orangutans in their natural habitat is unlike anything else. Being one with nature and gazing upon these beautiful creatures is an awe-inspiring, unforgettable moment. I’m so thankful for the opportunity to visit Bukit Lawang and the memories I’ll cherish for the rest of my life. 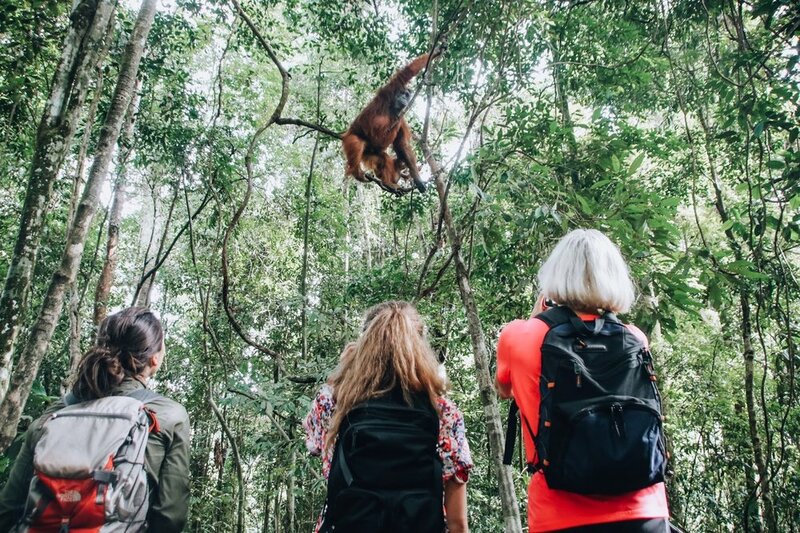 Add an orangutan trek to your travel bucket list—the experience is well worth it! To read more about my jungle adventure, check out my daily travel journal on my blog. I am in Bukit Luang with my friend Lillix, the man who talks to monkeys. Lillix grew up in a small village in the jungles of Indonesia, and from a young age, learned to love the jungle. Ever since he was six years old his father would take him to explore the most remote parts of the jungle to help him develop an appreciation for its beauty and importance. Deep within Sumatra’s Gunung Leuser National Park is one of the last places on earth to see the critically endangered orangutans in the wild. Deforestation has reached alarming levels due to increased levels of logging and growth of palm oil plantations. Eighty percent of Earth’s animals live in forests and many are unable to survive the deforestation which is destroying their homes. Here are five reasons why you shouldn’t miss out on this journey to see the Orangutans now. We can't even explain how much our love for animals have been broadened throughout our travel experiences. From sea turtles in Costa Rica to llamas in Peru to elephants in Sri Lanka - We can't get enough of these cute creatures when we are traveling. We've rallied up our top 10 favorite animal encounters from our expeditions so you can add them to your travel bucket list!